Preventing Restaurant Fires | Flue Steam Inc.
Don’t let your restaurant make the news due to fire—get help from Flue Steam now. 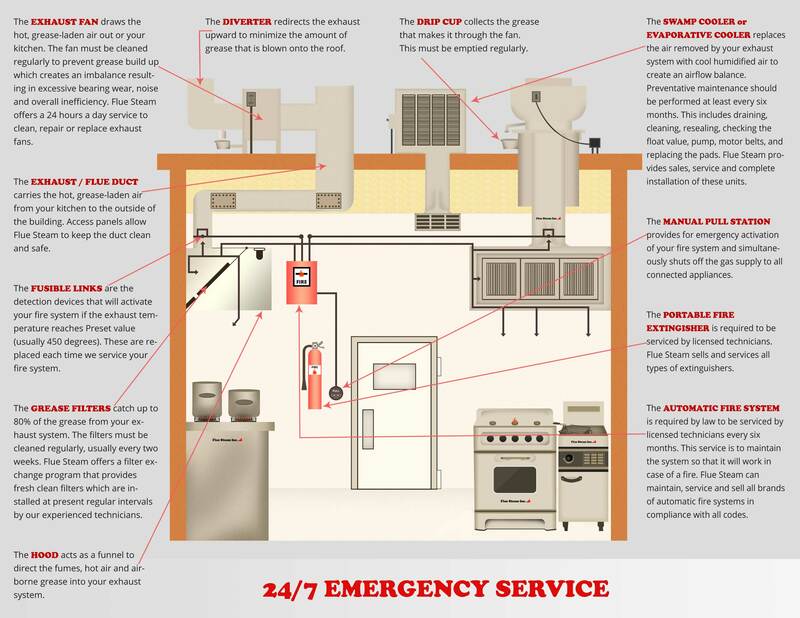 At Flue Steam, we are constantly advocating for all restaurateurs to invest in comprehensive fire prevention services, including regular kitchen exhaust system cleanings and regular maintenance for code compliant automatic fire suppression systems. Getting behind in either of these activities can have an extremely negative impact on your business, as the following news items show. Near the end of May, a Macaroni Grill located in Alexandria, Virginia caught fire and suffered over $300,000 in damages. The fire was noted at 2:45 am, a time when the restaurant was closed and empty, making it hard to say exactly why fire the fire started. What is clear is that the fire was centered inside a kitchen exhaust duct above a pizza oven, and then spread through the ductwork and burned the ceiling and roof area. Officials have concluded that the fire was an accident and that grease in the ductwork was the main fuel. This case serves to highlight the fact that restaurant owners don’t just have to worry about fires while cooking is actually going on. If grease is allowed to accumulate in the ducts, it can serve as fuel for any kind of fire, such as one caused by an electrical problem or even an arson fire. Another news item comes from Pittsburgh, where a pair of restaurants are just now preparing to reopen after a four alarm fire gutted them in February. While the cause of the fire has not been disclosed, we can get a major clue from the facts that A) the fire was ruled accidental by the insurance company and B) the restaurant manager was especially excited to announce that improvements in kitchen safety have been incorporated into the newly renovated restaurants. 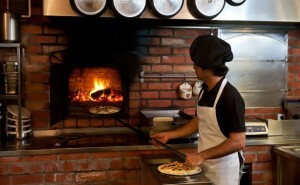 Specifically, the management mentioned that they have a new oven with a CaptiveAire CORE hood featuring the most advanced kitchen safety technology available, including a “self-cleaning system that scrubs itself daily.” From these facts it would not be unreasonable to conclude that some kind of accidental grease fire was responsible for the original damage to the restaurants. If you want to protect your commercial kitchen from fire risks, you need to remember 3 things. First of all, installing quality kitchen exhaust system equipment can help limit risk of fires. Secondly, this equipment needs to be cleaned regularly in order to do its job. Thirdly, in the event that a fire does start in the kitchen, you need a first line of defense against that fire spreading, which can easily be provided by an automatic fire suppression system. At Flue Steam, we offer all the assistance you need to limit fire hazards in your kitchen. We provide hand scraping of kitchen exhaust hoods as well as steam cleaning of ductwork and service for automatic fire suppression systems.